Even in today’s modern world of openly gay rugby players and openly depressed boxing champions, the idea of using hypnosis to help focus the mind is considered, by many a macho man, to be a sign of weakness. Yet almost every study and every recipient tells the same story – of a massive improvement in sports performance as a direct result of mind strengthening techniques. Vinny Shoreman’s enthusiastic and understanding response to my apology, after I disturbed his Sunday morning for a last minute telephone interview (on Father’s Day nonetheless), speaks volumes about his character. Like many of his fellow Mancs, Vinny embodies the happy-go-lucky nature of the North. But he takes it a step further than most, making sure that his interviewer is fully at ease before we begin our chat. A talent, or perhaps a tactic, that he’s developed over the ten years he’s spent coaching fighters and civilians in the art of mind manipulation. So did that make him more suited to training fighters than actually being one? And it was during those early days, where Vinny spent his time helping fighters to perfect their spinning elbows and switch-kicks, that he discovered a factor that no one else was discussing on the fight scene – the mental factor. Having watched tough men crumble under the pressure of a fight night, or technical artists stumble around the ring like they had two left feet, Vinny realised that it was not usually their training or their talent that was letting them down, but their minds. 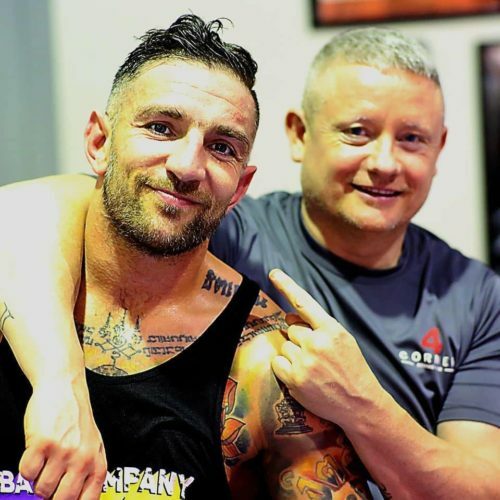 After twenty years in the Muay Thai world – as first a fighter, then a trainer – Vinny discovered mind coaching after attending a seminar in 2007. It grabbed him from the very start and he decided there and then that any other career would be wasted, this was him. His calling. His future. And thus began the journey of a man with a plan. A plan to help people. 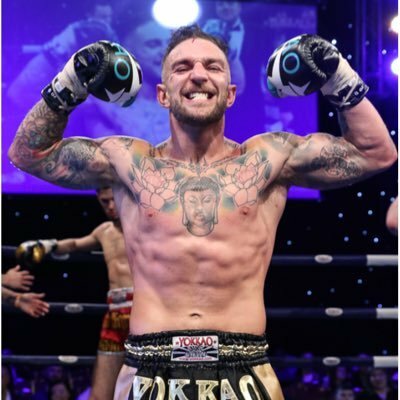 A plan put into practice when eight time world kickboxing champion, Liam Harrison, employed Vinny as his long-term mind-coach. 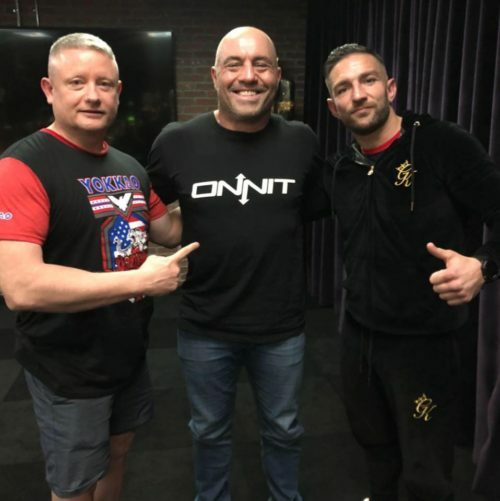 And again, perhaps more pointedly, when Joe Schilling utilised Vinny’s services before rematching three opponents that had previously beaten him – and smashed all three in revenge. So, are Liam and Joe the poster boys for mind coaching? I asked Vinny, naiively. “No. Absolutely not” came his straightforward reply. The no-nonsense language of the North beginning to show through the polite banter, reminding me that Shoreman is a man who deserves to be taken seriously, despite his placid demeanour. “Because mind coaching is about so much more than just sports”, he continued. So… what kind of success rate do you get, please Vinny? And have you ever turned a fighter away? So what are the fighters actually gaining from your sessions? 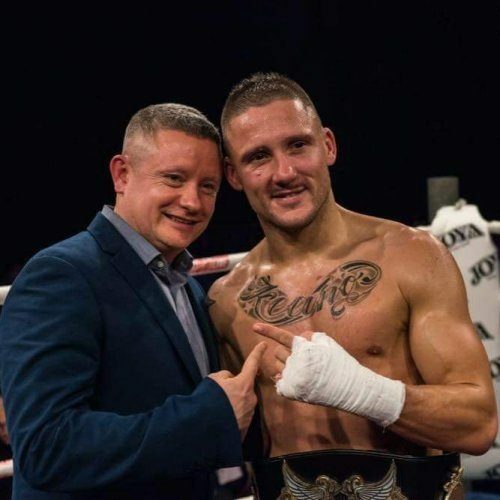 Eight-time World Kickboxing Champion, Liam Harrison, after another win, thanks in part to Vinny Shoreman’s Mind Coaching. Are you ever approached by people who don’t know exactly what they want? Just that something isn’t right? Skeptics would argue there’s no value to mind coaching… what do you say to them? Vinny stops abruptly, leaving that statement hanging. I can tell he means it. And that he’s been asked it a million times. I press him on this “noise” comment. Even up against the likes of Tyson Fury in boxing and Conor McGregor in MMA, Vinny’s preferred sport of kickboxing has managed to escape the need for endless vocals. Often resulting in better match-ups. Although, perhaps, at the detriment to ticket sales. Do you think maybe there’s too much shouting going on in fight sports these days? And with that, Vinny Shoreman hits Northern level ten. It’s hard to disagree. Vinny, without meaning to, has just proven his own point. Never once has he shouted about the benefits of mind coaching. He just knows. He’s resolute in his belief and confident in his results. And that doesn’t require shouting. He laughs, returning the conversation to it’s naturalistic laid back state. And his mind turns to the fighters that he watched spar in the Wildcard’s inner sanctum, the secret basement open only to Roach’s closest confidantes. We while away the next half an hour talking about the state of world boxing. And yes. He appears to know more than the boxing journalist that he’s speaking to. (I blame mind control.) Then, sadly, Vinny has to tackle Sunday duties. As I hang up the phone, having grinned through a thousand goodbyes, I feel like I’ve just made a new best friend. Or perhaps like I’ve just handed over my bank details. Either way, I’m left with a buzz of confidence that simply wasn’t there before. A conversation with Vinny Shoreman is like drinking a whole pot of coffee. In the sun. 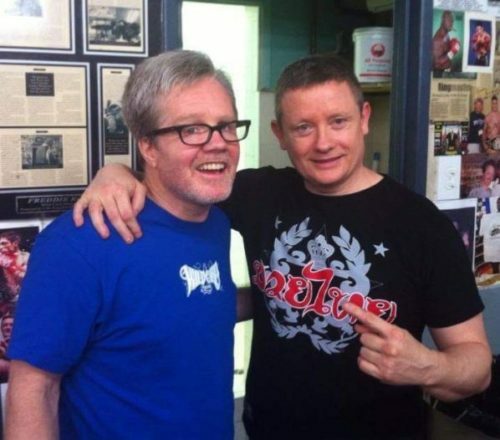 If you’re left in any doubt regarding Vinny Shoreman’s credentials, just remember that he has made an impact in the world of boxing, as proven by it’s greatest trainer Freddie Roach – in MMA, as proven by it’s greatest commentator Joe Rogan – and in kickboxing as proven by it’s greatest current champion Liam Harrison. And if you’re still doubting the benefits of mind coaching, well, he doesn’t care. And after getting to know Vinny, neither do I. The facts are all right there and there’s no need to shout. If mind coaching works on Northerners, trust me, it’ll work on anyone.